i think understanding people is better than knowing them. Does that make sense or am i suffering from too much underwater hydrophilosophia?? hope all good with you. Bless you and have a happy new year. @iamsrk 's DNA Column for December is out!! RT and spread! 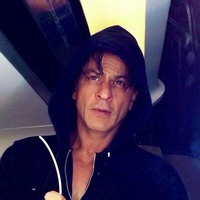 @gulpanag How well @iamsrk writes!! Excellent column in @dna. Yes. thank you so much and be well. Cold water...slow work....difficult holding breath & difficult shots. But Farha keeps the spirit from dwindling. One heck of a leader. Thank you Sharla and Mary ! Thanx Farhan Ritesh PC Lara, Nawab & my man Boman...one of the finest film making fun I ever had. Hope we all make 10 sequels to Don! Germany is the warmest... In Nov & Dec & the whole year round....the people there r the sweetest & lovingest. I miss Germany & Berlin. OMG!!! I just noticed the first signs of gills & fins sprouting around my skin. I hope I turn into a Starfish & not a Trout!!!! Coming to the end of a gruelling schedule...all tired but the action team doing some scary jumps from the high diving board. My favourite line from Darr...."tumhari sabse Badi problem yeh hai ki tum bahut acchhe aadmi ho." Anyone who claims men are the equal of women have never seen a man trying to wrap a Christmas or any present. This is a universal truth. Shooting with an amazingly hard working unit. 25 mins to Christmas, away from families, singing Christmas carols underwater & smiling. Saw a bit of DDLJ on tv....kids asked 'why papa'. Guess too young to know wot romance is...yet! Got babies x'mas gifts & got hugs in return. On a lighter note...my managers thank the social media for letting me not only know the films I am doing but also the cast. Scenes anybody?? And my friend Kallis thank you for being such professional and a gentleman. Learnt the meaning of silent strength from you. See u soon. Got myself the coolest set of cans by Starck. Now to get myself some music...difficult prospect for a tone deaf guy. Send me suggestions. “And all I ask is quiet sleep & a sweet dream when the long trick’s over.“ Faroukh Sahib…Allah bless your soul. U are dearly loved & missed. My biggest regret that I never got to spend time with you, Faroukh sahib, as I had requested. Should have done it earlier. I feel so sorry. Damn, didn't know Farooq Sheikh is no more. So sad. Oh!! I don't know much about him! But I really liked him in that interview he did with SRK! And also from Maya Memsaab. Thought he was so natural in such good art film along with SRK. May he rest in peace. Partied with the kids late into the nite.Most of them are more 'proper' in their behaviour than i ever was. Proper is the new Cool i guess. Somedays I get this feeling….that I have the best team of talent & hardworking men & women at Red Chillies. Thank u all for making movies. At times I do good things & at times the opposite…last two days I have done nothing. Dormant languid lazy….it’s a nice new feeling. Anonymity & club hopping with the boys. Fun but I am too young for all this. Gimme a few yrs & I will paint so many towns in so may colours. sir take out time tomorrow…let’s do a little FIFA…I am also tired of being beaten at all games by kids since last few days. Allah will bless her. I will pray for her tonight. Ai Ajnabi tu bhi kabhie Aawaaz de kaheen se…roz roz resham si hawaa…plays in my car oddly yet pleasantly out of place in a strange land. Wonder how many people will think that the baby is his! Send #HappyNewYear #WackyWishes @hny & if I like it, I will not only re-tweet it but also send you a personalized new year message.